Prime Minister Malcolm Turnbull has a new second-in-command, and it seems like the two new comrades are bonding right away. Nationals Party senator Barnaby Joyce was last week elected unopposed as leader of the party, making him the new Deputy Prime Minister of Australia. Turnbull is currently touring Queensland, on a four-day visit to the state, and on Tuesday met with Joyce in Rockhampton to officially open a new health teaching facility at the city's university campus. Turnbull spoke with fondness about his new deputy, referencing a classic movie to describe their new friendship. "It's not 'Thelma and Louise,' it's Barnaby and Malcolm but we're on the road trip and we're having a great time," the PM said. On Twitter, everyone was making the same joke. @joeobrien24@TurnbullMalcolm@ABCNews24@Barnaby_Joyce Remember how Thelma & Louise ends? 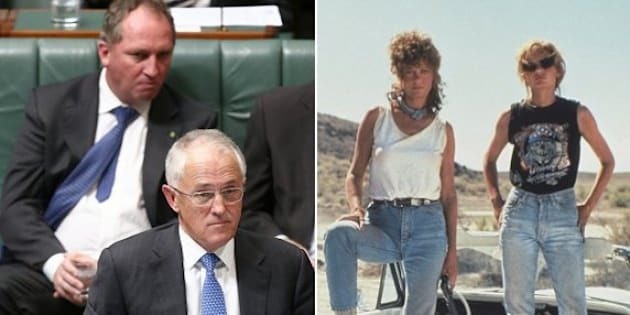 Turnbull describes himself & Barnaby as the "Thelma & Louise of Australia?" Guess he doesn't know how that movie ends. We've found at least one way that the PM and his deputy are like Thelma and Louise; Malcolm DOES love a good selfie.